John Merck is a partner in the firm. John graduated from the University of Houston in 1984 where he received a degree in Accounting. In 1985, John began his career for the then Big 8 accounting firm of Ernst and Whinney. 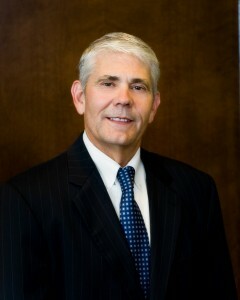 John graduated from South Texas College of Law in 1988. John is both an Attorney and Certified Public Accountant. John’s accounting background serves him well in his primary areas of practice: estate planning and probate, oil and gas, real estate, business organizations, and business transactions. John is a member of the Wharton County Bar Association (President, 1992-93), State Bar of Texas (former Chairman, Panel 5C Grievance Committee), Texas Society of Certified Public Accountants (Victoria Chapter), and the Coastal Conservation Association (Executive Board, Matagorda Bays Chapter) (State Board Director, 2009-). John was also a past Director of the El Campo Chamber of Commerce (1997-2000). John is a native of Matagorda County where he was raised on his family’s rice farm. John is married to Jean and they have three children. John enjoys hunting, fishing, traveling, and most of all, time at home with his family.